This past Sunday I was in the studio watching this dope GQ piece with Lauren London quizzing Nipsey Hussle on how well he knew her but I realized I had to jet to my guy's anniversary dinner party so I figured I'd watch the rest of it when I got back home. Little did I know, that by the time I got back home that nothing would be the same again and we all know why. While I was at the dinner party my phone was blowing up and my guy sent me a TMZ piece saying Nipsey was shot in killed. I KNEW it had to be a joke so I went to the place I always go to verify things...twitter. And that's where it got confirmed and I was shell shocked. I heard Dave East saying at the candlelight vigil he had in NYC for Nip that he wasn't around like that when BIG & Pac died and that's why this one hurt so bad. Well, I was around for BIG, Pac, Big L, Jam Master Jay, Big Pun, Sean P, Freaky Tah etc. and this one STILL hurts me the most. Let me explain, see all of those MC's I just named except Pac was all about the music for me. Where as the love I had for Nip had ZERO to do with the music. I was a fan of the man. I first got down with Nip's movement when I read a story about him wanting to open STEM (Science, Technology, Engineering and Math) programs for kids in the inner cities across the country. Why was that SO impressive and important to me? Because for the past 19 years I've worked in EVERY hood in SE Washington DC risking my life EVERYDAY to help shape and change the outlook of teens and kids who feel like they're trapped in the hood. So the SECOND I saw STEM...I was all in on Nipsey. And again, this had ZERO to do with the music. In fact at this point I hadn't heard one single song from the man. I told one of my peoples the other day that the music was just the icing on the cake when it came to Nip but PLEASE don't get it twisted and think I didn't like Nip's music because NOTHING could be further from the truth because his debut album "Victory Lap" was EASILY one of my fave albums of 2018 for me! Another thing, for YEARS I've been looking for a catch phrase to explain to folk what I do in the hoods for my teens and thier families and when I heard Nip's 2nd single "Hustle & Motivate" I was like..."that's it right there." That's the PERFECT explanation for what I do! And not for nuthin "Rap Niggaz" and "Hustle & Motivate" are two of the dopest back to back singles I've heard from ANY artists in the past 10-12 years...EASY! Another thing I LOVED about Nip was dude was 100% real. We just did an ep of my podcast #Apt5B on MC's we actually believe what they're saying in their rhymes and I'm kicking myself for forgetting to name Nip cause that is one mofo who I whole heartedly believed EVERYTHING this man says! When I saw the video for "Rap Niggaz" it was a wrap for me! This wasn't some ole just chillin in front of the bodega with 8 of your homeboys type video...nah...this dude had EVERY single Crip dead or alive, locked up or free in this video! For somebody else, that might not mean anything to you but to me, that meant everything to me. After I found out Nip got murdered, my whole mood changed at my guy's dinner party. Everyone was shocked but after a good 5 minutes everybody was back to basics. Not me. I was done. I told my wife I was ready to leave and I bounced. I came home and finished watching the GQ piece with Nip and Lauren but of course, it wasn't the same anymore because a great man was killed. A husband was killed. A father was killed. A leader was killed. The blueprint was killed. A legend was killed. 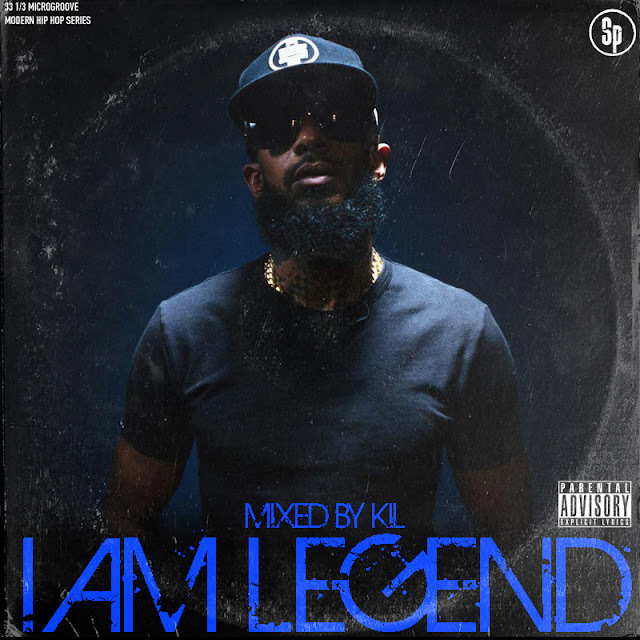 So whether you've been a fan of Nips for years or you're new to his movement bang out to over 2 hours of some of my fave Nip BANGERS on my "I Am Legend" mixtape and salute a man who was not only helping to change South Central LA but who was helping to change the world. Salute.